Does your child seem bothered by the tag in the back of their shirt? Are there certain foods that they avoid? Do they always seem to be fidgeting? These behaviors are an indication that your child may be sensory seeking or sensory avoidant. While helping your child understand their sensory needs could be an uphill battle, there are some activities that can help them day by day. Shaving cream in the bathtub is an easy and clean activity that can make bath time more fun for your child! Your child can draw on the tiles and also squish the cream between their hands. There’s very little clean up, and it’s cheap. Next time you’re at the grocery store, add an extra can of shaving cream to the cart and let the fun begin! Playing in a sand box may not be as clean as shaving cream in the bathtub, but it’s an easy way to bring sensory seeking behaviors and play together. 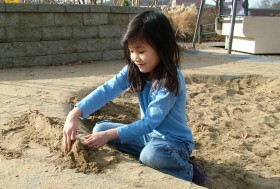 Sand toys, a small sand box, and some sand is all your child needs for a couple hours of fun and sensory input. Just make sure they take their shoes off outside the house so there’s less clean up! A sensory box or a sensory bin can be a great distraction and full of activities! You can include stress balls, a slap bracelet, silly putty, balloons, squishy squeeze toys and fidgets. Many of these toys can be purchased at the dollar store and easily replaced if they’re broken or misplaced. Putting the box or bin together could be an activity for you and your child to do together! Sensory Tables are a little bit more involved than a sensory box or bin, but if you have the space at your house, you may find that creating one is worth the effort. Plus, you can change out its contents depending on the season. You’ll want to start with something that has texture – sand, water, dirt, leaves, gravel, mulch, beans, rice, cotton balls or even Legos. You can add other items, too, maybe sticking with a specific theme. If you’ve got dirt, maybe some fake flowers; if you’ve got sand, maybe some sand toys or seashells, and if you started with beans, maybe you’ve added rice and measuring cups. The possibilities are endless! Gardening is a fun sensory activity, with an added benefit once the flowers bloom! At the beginning of the spring season, you can buy pots, soil and seeds – get your child involved by letting them pick out which flowers or plants you want to grow. Help your child divide the soil into the different pots and then put the seeds in. You know your child best, and you’ll be the best judge of what activities they can and cannot handle. Sensory activities cannot replace the benefits of working with an occupational therapist, if that is needed, but hopefully the activities can be incorporated into your family’s everyday routines.